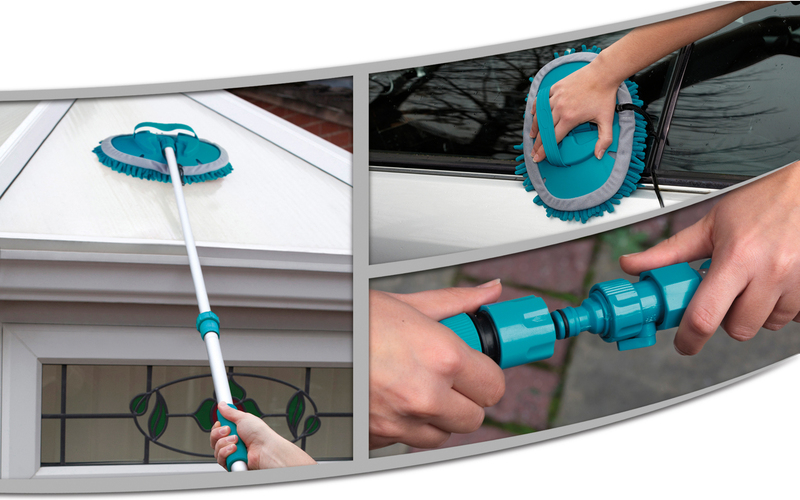 Keep your car, windows and conservatory beautifully clean using this Beldray multipurpose outdoor wash mop featuring a fantastically long handle which can extend up to 166 cm for further reach. Soft and absorbent, the chenille mop head is able to lock in dirt efficiently and can even be detached from the handle in order to be used as a handheld unit. The aluminium handle attaches to a standard size hose pipe in order to clean with fresh water, perfect for hosing off the car after a good wash. This fantastic Beldray mop is ideal for outdoor use and can be used to clean cars, windows, caravans and conservatories with ease. With a soft and high quality chenille head, the mop can lock in dirt for an effective clean without leaving streaks or scratches. The brilliantly strong aluminium handle can extend from 91 cm to 166 cm so you can reach further and higher while cleaning. A hosepipe can be attached to the handle in order to clean with fresh clean water, far more efficient than using a mop bucket. Measuring 25 x 16.5 x 4 cm, the mop head can be detached from the handle and used as a handheld washer for a through clean. Very good product clears car in notime. Can you get replacement heads as i need one to dry the car ??? Love this mop but can you get replacement mop heads. Hallo, ich brauche auch Ersatzsischer,kann man die hier bestellen? Looks to be good but can Iget replacement mop heads.